Thousands of coastal fishermen in Thanh Khe Ward, Da Nang city on Monday crowded at the Temple of Whale to pray for successful fishing seasons and good weather. The fish prayer ceremony or whale worshiping ceremony is held every year on the 16th of the first lunar month. At the prayer ceremony, elders worship the whale that fishermen believe to help them encounter trouble at sea, bring more luck and pray for good weather, many fish and shrimp at boat. During the ceremony folk games depict assertive traditional culture such as basket boat race, net knitting competition, rod pushing sport, fish salad cook … were also held. After the ceremony, fishermen launched the first nets to remarked the new fishing season. Unlike in other countries where whales are revered, in Vietnam the practice is based on specific incidents in the past where the giant mammals beached near local fishing communities. 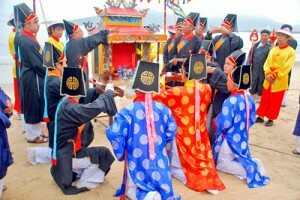 The Vietnamese call whale as “Ca Ong” or Mr. Whale and whale worshiping ceremony is unique to Vietnam. Beached whales are given traditional Vietnamese funerals — they are buried for between five and 10 years, and then whale bones are excavated and kept above ground. Whale oil is separated off and stored in huge ceramic containers to be used during ritual cleaning of the whale bones on their death anniversary.